Home > News release > VILLAGE ISLAND now official distributor for SED Decimator products in South-East Asia and Japan. VILLAGE ISLAND now official distributor for SED Decimator products in South-East Asia and Japan. Village Island Co., Ltd, with Head-quarters in Tokyo, is proud to announce its official distributorship of SED Decimator. “Village Island has a long history of delivering Satellite and Broadcast equipment, solutions and systems through North-East and South-East Asia. Following our experience of integrating and supplying SED Decimator products, it was natural for us to become official SED Decimator distributor and offer our full support to our wide reach of customers. 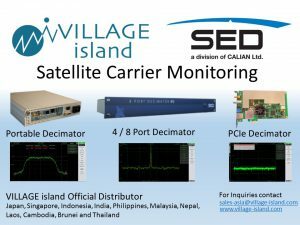 SED Decimator products complete rightly our overall Broadcast and Telco monitoring offer, as cost-effective and high-performance RF Spectrum Analyzers”, says Michael Van Dorpe, President of Village Island. The countries addressed by Village Island are Japan, Indonesia, India, The Philippines, Malaysia Thailand, Vietnam, Nepal, Laos, Cambodia, Brunei and Singapore. Village-Island will distribute products such as 4/8 Port Decimator D3, Portable Decimator D3, and Decimator D3 Card a third generation spectrum measurement and analysis providing high-end performance at a low price! SED System, based in Saskatoon, Canada, is a communication technology leader company supplying both systems and services to the satellite communication industry. SED System serves satellite manufacturers, operators and service providers around the world. SED System also provide satellite operations services to control and monitor satellites for government and commercial clients. SED System applies systems design and integration skills in terrestrial communications and military markets as well, providing test systems and contract manufacturing services to prime contractors and equipment manufacturers.